5G is upon us, with the first smartphones supporting 5G expected on the market in 2019. The promise of higher speed for high data rate communication and lower latency for real-time interaction is alluring for users. This combination will not only provide for new video formats like 360 degree video (video traffic is expected to account for 73% of all mobile data traffic by 2023), but also enable new technologies such as autonomous driving, augmented or virtual reality interaction, and a tactile internet with applications in fields ranging from industry automation and transport systems to healthcare, education and gaming. Antenna design for mobile phones has always been a challenging topic for engineers, and designing antennas to support the new 5G frequency bands will raise the bar further. Two frequency ranges are of most interest: frequency range 1 for sub 6 GHz bands communication and frequency range 2 for communication at the millimeter (mm) wave frequencies above 24 GHz. Some of the bands are still under discussion, and the exact frequency designations will vary geographically. Initial mobile phone integration will focus on sub 6 GHz antennas, with mm-wave support being considered for providing broadband links to homes or other fixed infrastructure initially, before finding its way into mobile phones in the near future too. 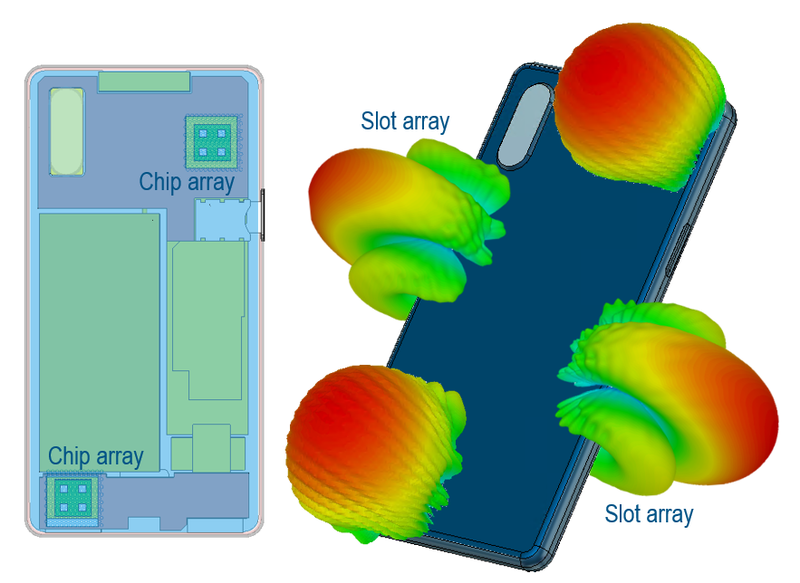 Simulation plays a fundamental role in designing antennas in general, and especially for designing the highly customized, individually tailored, antennas found in compact mobile devices. The challenges in the two frequency ranges are different, though. Sub 6 GHz antennas have to be designed in the context of the compact mobile phone, fitting in to whatever space is available among all the other components which are densely packed into the form factor specified by the design team. Of course it is not only 5G capable antennas that are required. 5G will be used alongside existing 4G, 3G and Wi-Fi communication channels. This increases the number of antennas to be integrated in the phone, especially since most of these standards also include support for Massive Input Massive Output (MIMO) multi-antenna operation. Even if individual elements can cater for different standards simultaneously, there will still be a requirement for housing at least half a dozen antennas. Finding space for antennas in a densely packed compact phone is difficult. The antennas don’t only function as standalone “antennas” in the traditional sense, but there is a strong interaction with the rest of phone. Understanding the resonant behavior of the phone is important since the antenna to couple energy into natural phone resonances. These are strongly dependent on the exact configuration of the internal structure, which can change over design cycles. Coupling to phone resonances is strongly dependent on antenna position. Optimal placement of the antennas in the phone, and also relative to each other, is critical to their performance. Positioning changes of a few millimeters will make the difference between a well and poorly performing system. Antenna engineers must be able to respond quickly to design changes. 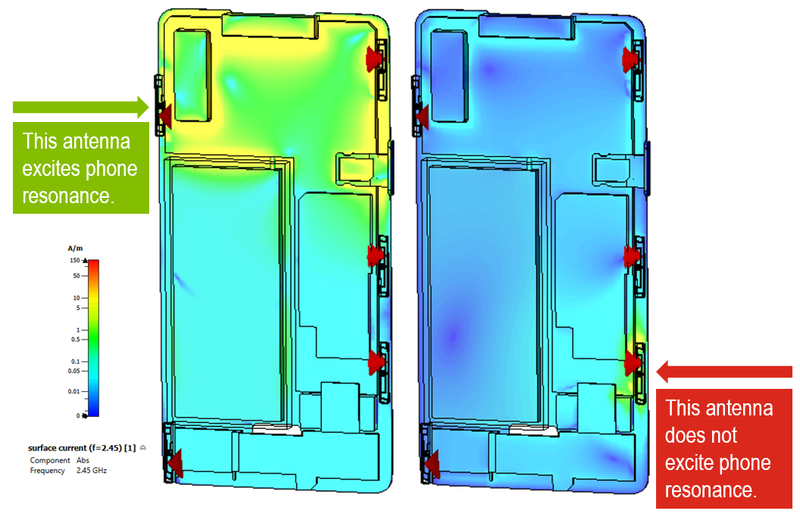 Immediate access to design change descriptions, an efficient workflow for simulation model setup, and of course efficient simulation algorithms, are all extremely important if good antenna designs are to be achieved within the tight time constraints of a short device design cycle. The increasing demand in mobile data traffic will require mm-wave communication to complement sub 6 GHz massive MIMO. Research into mm-wave antenna integration in mobile devices is well under way. The small physical size of antennas at or above 28 GHz makes the use of chip-integrated arrays – often containing four elements – an interesting option. These antennas have a high gain and support multiple beams, thus addressing the design goals of providing a high quality data link in all directions around the phone. 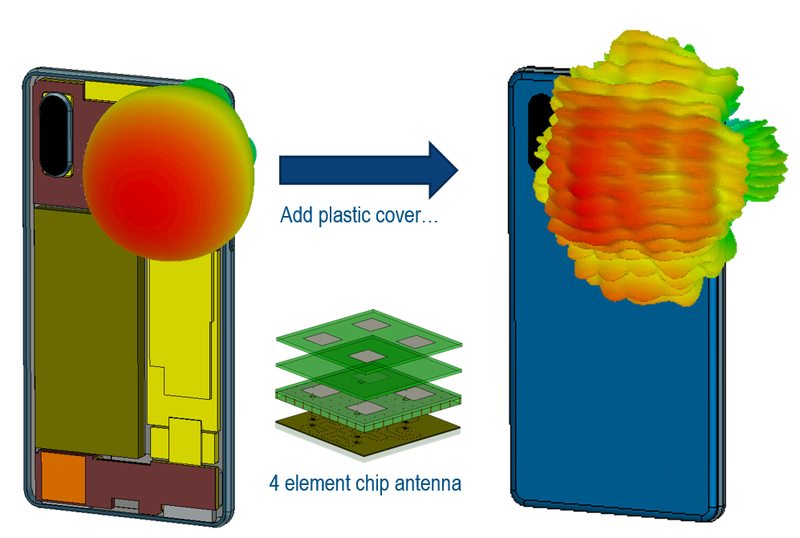 Placing a chip antenna behind a plastic cover substantially changes its radiating performance. Radiation from antenna behind 2 mm thick ABS plastic cover. 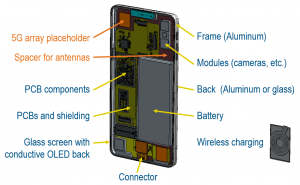 The antenna design in this case is not as tightly coupled to the overall phone structure as at lower frequencies. Rather, the challenge becomes one of integrating the antenna in the device behind a cover, which at mm-wave frequencies is no longer electrically thin and thus has a substantial effect on the radiating performance of the antenna. Techniques used for radome design in the aerospace industry find application here. Antennas can be efficiently integrated behind plastic or glass covers by engineering the cover geometry to act locally as a lens, and even behind metal covers by including electromagnetic windows, perhaps based on Frequency Selective Surfaces (FSS) design principles. This approach improves the radiation pattern substantially and improves scanning behavior. Another option made possible by the small physical size of antennas at mm-wave frequencies is the integration of slot-based designs in the metal rim of phone, as shown in Figure 2. 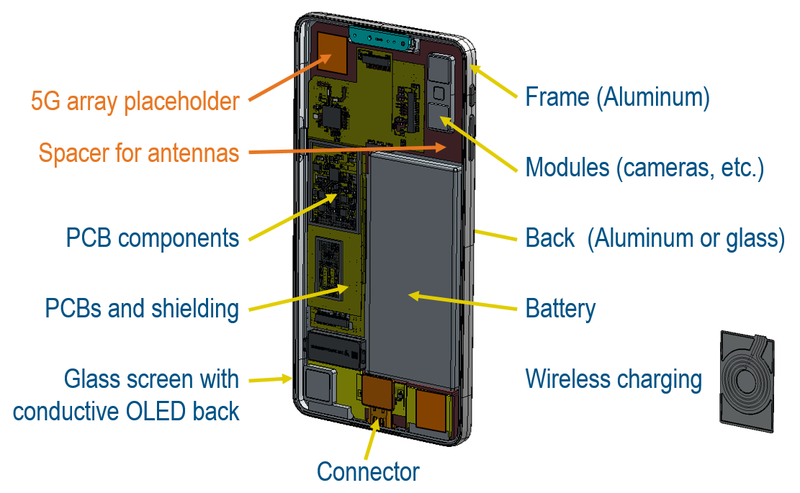 Chip (top and bottom) and slot (sides) array antennas placed in a phone with metal housing. For any equipment that is used in the immediate vicinity of a person, ensuring the safety of the user is of paramount importance. Certification standards for exposure of humans to radiated fields have to be met before a product can be released onto the market. At sub 6 GHz frequencies, the existing Specific Absorption Rate (SAR) standards apply. At mm-wave frequencies, field penetration into the human body is very small. Most of the energy is reflected, and most of the field that does enter the body dissipates within 3 mm of the surface, so SAR is not an appropriate measure of human exposure. Rather, it is proposed to measure the power flow on surfaces at a certain distance from the device. Standard SAR evaluations can be used at sub 6 GHz frequencies, while poor field penetration at mm-wave frequencies makes power flow evaluations more appropriate. High data rate low latency communication is coming soon your phone. Efficient highly performing antennas are key enablers for ensuring a high quality continuous communication link. 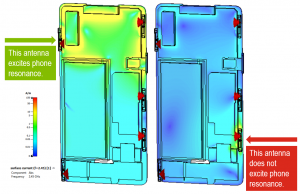 Balancing performance and safety compliance requires accurate modeling of the phone and the user, not only electromagnetically but across physical disciplines.